Tobias Jung, Zoltán Kiss- Area Sales Manager - East Europe - Endrich GmbH. The arising demand for SMD power inductors is mostly driven by requests arising consumer applications like camera, mobile phone, notebook PCs, however standard industrial applications have also special requirements, that has to be fulfilled. Electrical power supply circuits’ lines always need power inductors as well as chokes in order to accumulate and store electrical energy in the form of magnetic energy (power inductor) and to cut high frequency AC current components (choke). In system design it is also necessary to filter EMI noise or provide low signal losses, therefore power inductors need to be used. For battery operated systems the energy storage feature of these inductors is also essential. The basic condition of designing an outstanding product, is the deep knowledge and understanding the characteristics of the components used in order to make the right choice. This article gives a brief overview of the technologies used by the popular manufacturer ABC distributed by Endrich in Europe. As mentioned, surface mount power inductors, - taking minimal printed circuit board space - are used to store energy while also filtering EMI currents with a low-loss inductance for voltage conversion applications, like e.g. DC/DC converters, providing a cost effective, high-performance solution. Energy storage in DC-to-DC converter. Low pass frequency filter applications are used in DC power lines in order to filter the low frequency ripple current noise. For filter applications low DC resistance, low AC resistance, effective DC superimposing characteristics are necessary. Low pass filters are utilized by their behavior, they pass the low frequency signals, and attenuate the frequencies above the cut-off frequency (usually output voltage of this frequency component is less, than 70% of the input voltage) . As the impedance of the inductor is growing with the frequency (XL = ωL, where ω = 2 П F), the high frequency signals are prevented to reach the load. The inductive low pass filter is a very simple - one component – solution, and usually preferred in AC-DC power supplies’ DC side for filtering out the AC ripple generated by the rectification of the AC to DC. The output of such a power supply requires low resistance, which could be achieved with this simply solution in high current circuits, when the compact size and low weight are not in focus. Larger inductance, low DC resistance inductors also can be used in AC inputs as EMI noise filters. 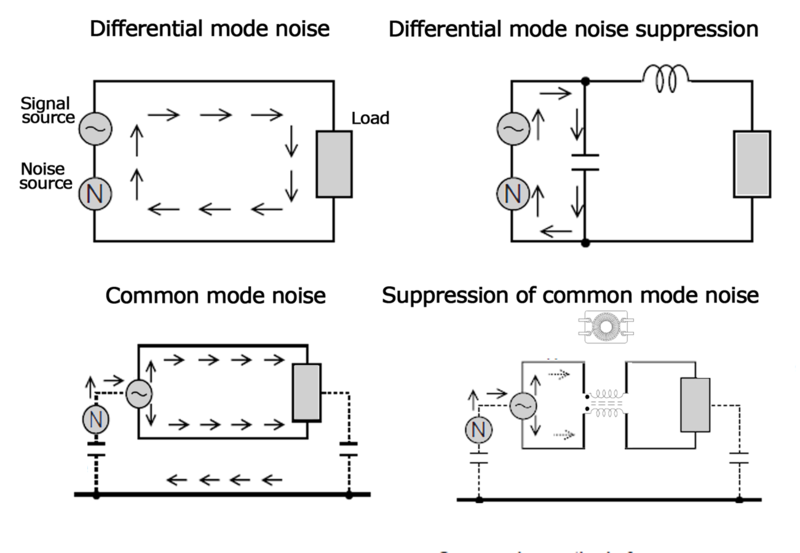 Switching mode power supplies generate common mode and differential mode noise. Differential noise has the same path as the input power, no current flows to ground, all differential mode current flows through the load. Common mode noises are represented by spikes, common mode current will flow towards ground through parasitic capacitances. They pass differential currents showing low inductance while blocking common mode current. The magnetic fields created by the differential mode currents are canceling each other, so the component presents nearly no impedance for signals, but works as a high impedance (inductance) for common mode current (noise), since the flux caused by them accumulates. 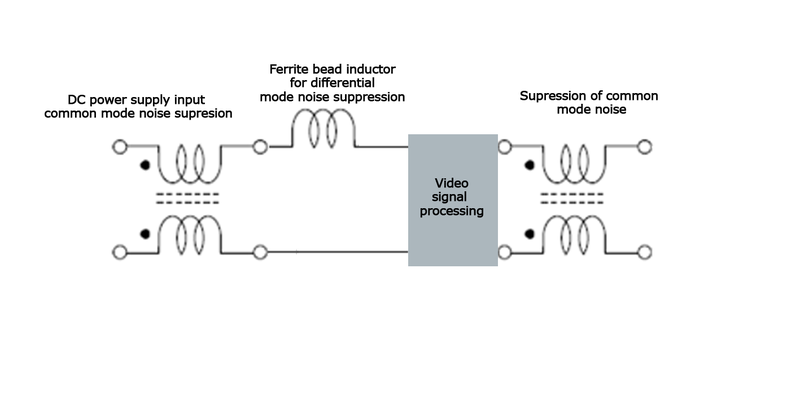 Common mode choke coils are suited for noise suppression on lines with high current flows, like power supply lines, or on lines where signal waveform distortion is a problem, like on video signal lines. SMD line filters are also used as EMI filters and CAN bus chokes. The ABC’s SF0904 family is AEC-Q200 qualified and therefore perfect for automotive applications, while the CF0904 series have an improved operating temperature range up to 135 °C. SMD power inductors are also used in DC/DC converters for energy storage purposes. There are buck (step-down), boost (step-up), and buck-boost converters which convert the DC input voltage from high to low or low to high in order to provide the DC power to various circuits in a system. In order to contribute to a higher efficiency of DC/DC converter, ABC developed the DM family of inductors, which are pad compatible with the SH and DH families. This item uses Mn-Zn as core material [before: Ni-Zn] and Ni-Zn for the shielding core. Due to the different material performances, the DM type have much lower core losses. The saturation current is typically 25% higher and the DCR 25% lower compared with DH type. The picture shows the efficiency of DCDC converter MP1494 of MPS compared when using DH and DM type inductor as output choke. The next step for ABC is to develop DM - style parts with a cubic housing in order to have more performance based on the same AxB dimensions. This development targets 100% the European market, where a high performance, high accuracy is needed and the low profile is not the major driver of electronics development. According to the roadmap these parts might be available from Q4/2013. The idea is to make 4x4x4mm / 5x5x5mm / 10x10x5 mm parts. High rated currents: saturation current must be high enough for the inductor to keep operating in the linear range. Low DC resistance: important for high efficiency of the converter. Low losses at high frequencies: important for high efficiency and low heating of the converter. SMD housing: kppe oss low for mass production. The magnetic field generated by the shielded inductor stays within the component, and the emitting of magnetic disturbances outside the package will remain minimal. In the unshielded inductor some of the magnetic flux is radiated outside, therefore the risk of coupling to other subsystems and components is higher. Using shielded inductors give some more advantages, as the complete magnetic flux remains inside the component, the power efficiency is higher, less wire turns are required to achieve the same inductance. However the inductance change vs current curve drops earlier because of the saturation characteristics, so the unshielded power inductor is easier to work with larger current. A very popular item in the European market this the classic square type flat SMD power inductor. These items are widely used in all kinds of applications. The construction is optimal for low profile which is required in many “Asian products" like camera, HDD, notebook, etc. It can be produced at low cost that involve mainly manual work. Due to manual placing of center pole into outside shielding core, the air gap cannot be controlled very well. The standard tolerance for L and DCR is typically +/-30%. However, the industrial market requires more precise components. Also, "European products" normally don't require low profile. A cubic housing would be more efficient. ABC is continuously developing new parts to contribute to this trend. 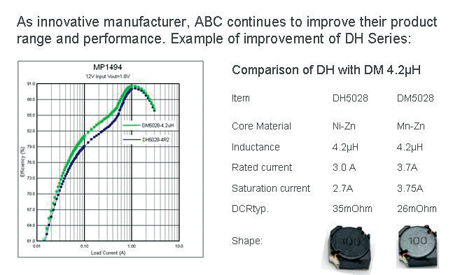 To solve the issue about wide tolerances, ABC developed the DH type, which is pad compatible with the SH type. This construction has two major advantages. The center pole with winding is auto-placed and centered into the RI core (shielding core). This enables the manufacturer to control the air gap very well. The typical tolerances for L and DCR are controlled at +/-20% (from 10µH and higher). The second advantage is the top down orientation of the lead wire. Other than with SH type, the end of the wires are guided to solder pad from top of the inductor. This can avoid soldering problems. 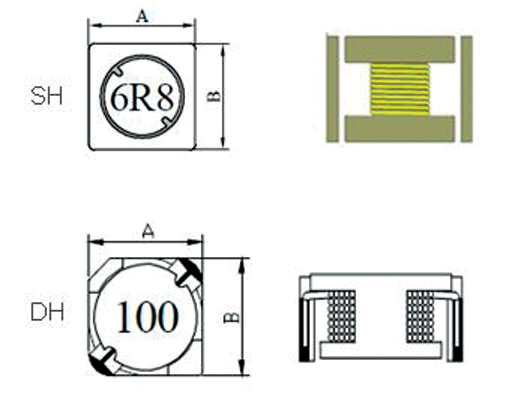 Unshielded power inductors are of various shapes such as rectangular, square, oval and round base. To meet the industrial requirements ABC tries to follow the demand of production engineers. One good example is the case of ABC1s SR family, which is produced with a glazing terminal. This "glaze" supports better shock and vibration resistance and can improve the resistance to shear force by factor 2-3. 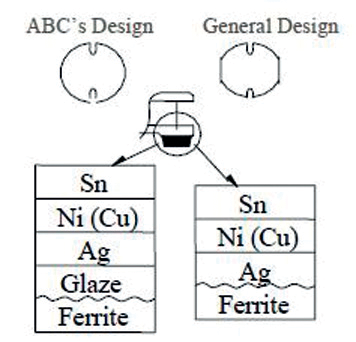 As the shielded inductors are more expensive than the unshielded, as well as it is sometimes harder to work with them on higher currents than with unshielded ones, ABC offers a golden middle way, by using semi-shielded inductors with very small dimensions. Due to their construction, they reach nearly the same performance compared with standard shielded inductors but at a much lower price. They are not fully encapsulated to the shielding metal case, but covered by magnetic epoxy resin from the side. As it could be seen on the below table, the coupling factor and the mutual inductance with semi-shielded design of the same coils could be significantly reduced. To support your design and request engineering samples and further technical support, please contact the authors. Elektronet 2013/4 Elektronet : elektronikai informatikai szakfolyóirat, 2013. (22. évf.) 4. sz. 32. old.